Were in town yesterday, this year pouring the fairly recently bottled 2016 vintage. It was a vintage of superlatives. There were sensational wines from every appellation. Briefly, some of the 2016 wines that made impressions on me were (in no particular order) Clos Fourtet, Les Carmes Haut Brion, Smith Haut Lafitte, and Leoville Barton. Impressive they were, but these wines are mere infants. They're going to need time. In fact, believe it or not, there were a few wines which I felt were already entering the period of "shutting down." Meaning that their structure was particularly dense, denying the inherent fruit to fully express itself. As I've written before, I consider 2016 to be the first great homogenous Bordeaux vintage of the post-Robert Parker era. The wines, at least the Cru Classé wines, are going to need time in the cellar before they really strut their stuff. Back in the spring of 2013, members of the international wine trade gathered once again in Bordeaux, this time to taste the 2012 vintage. The vintage received little fanfare, certainly not praised as were the back to back blockbusters of 2009 and 2010. Though not receiving much praise from the wine press, I found the vintage charming, and in some locales, fantastic. I remember my first day of tasting that year in the warehouse of a negociant tasting barrel samples for hours. The firm's General Manager walked over to check on me and asked what I was liking and I sent him to the Château d'Issan sample. He took a taste and made the "big eyes" face, as he was impressed. d'Issan was not the only Margaux which was impressive. When I returned, I sat down with David to discuss the vintage. Pomerol, St. Emilion, Pessac-Léognan, and Margaux were the winners, I told him. The consensus among critics included the former 3 appellations, but David was quick to point out, "Margaux? Didn't hear much about that. I think you're on your own there." When Robert Parker's assessment of the vintage out of barrel was released, the aforementioned d'Issan received a modest (87-89) point rating from him. Sometimes we agree, sometimes we don't. I thought it was fantastic and continued to recommend it to our customers. Once the wines were bottled, Parker re-tasted it and gave it 95 points. After that, it seemed that wine writers began to recognize that Margaux had its set of great 2012's also. We had a good run with the 2012 La Gurgue, a petit chateau from Margaux, a couple of years ago. I continue to look for 2012 Margaux's on price lists when we receive them, and found a solid deal not too long ago. 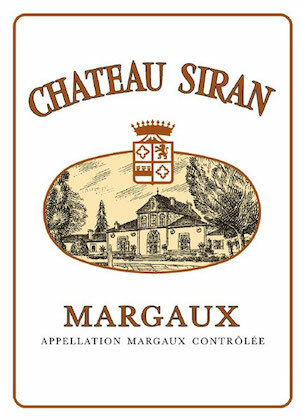 The 2012 Château Siran, Margaux is not only a solid deal, it can be enjoyed now (decant, please) or will gain in complexity if cellared over the next two decades. Château Siran is located in Labarde, the southern-most commune in the Margaux appellation. After La Lagune, Cantemerle, and Giscours, it's the fourth recognizable chateau one passes when driving north from the city of Bordeaux. The vineyard is planted to Cabernet Sauvignon and Merlot primarily, though it is also comprised of 13% Petit Verdot, which can add spiciness and concentration to the wines. Siran is one of very few chateaux to have had the same family in charge for more than 150 years. In 1859, the renowned Miailhe has been in charge, and currently, Édouard Miailhe represents the fifth generation in control, a position he took over in 2007. Out of barrel, the 2012 Château Siran showed classic structure with spicy and herbal aromas. On the palate, the wine showed an earthy mineral core with dark fruit, pencil lead and truffle notes. I thought enough of the barrel sample to keep a look out for the wine once it was bottled. We found some a while back and they landed here recently. Out of bottle, tasted over the holidays, I found the wine to be in a good place with the fruit expressive, rising about the earthy structure. The herbal and truffle notes are present, but that black cherry and cassis fruit make for a pleasant tasting experience. At least it was a hit with the group I shared it with. I took my eye off the bottle for a couple of minutes, and when I went back for a second glass, all I got were the lucky drops! "Tasted at the vertical held at the property, the 2012 Château Siran, a blend of 55% Merlot, 35% Cabernet Sauvignon and 10% Petit Verdot, has a very composed and delineated bouquet with scents of red plum, raspberry, mineral, cedar and a touch of graphite. The palate is medium-bodied with fine, gently grippy tannin, and graphite-tinged black fruit that turns spicier towards the finish, which displays commendable substance and persistence - a 2012 Margaux with ambitions. This is a very fine Siran, much better than many of the wines produced in the 1990s and it comes recommended."